An Attractive 1930's Dormer Bungalow Enjoying Much Privacy. Upgraded & Modernised to an Excellent Standard with Neutral Decor. Re Roofed by Reputable Local Builders 'Monarch' in 2018. Ideally Located a Short Distance from Ramsey Town, on the Bus Route. Spacious Reception Hall, 26ft4 Through Lounge Diner with uPVC Conservatory Off. 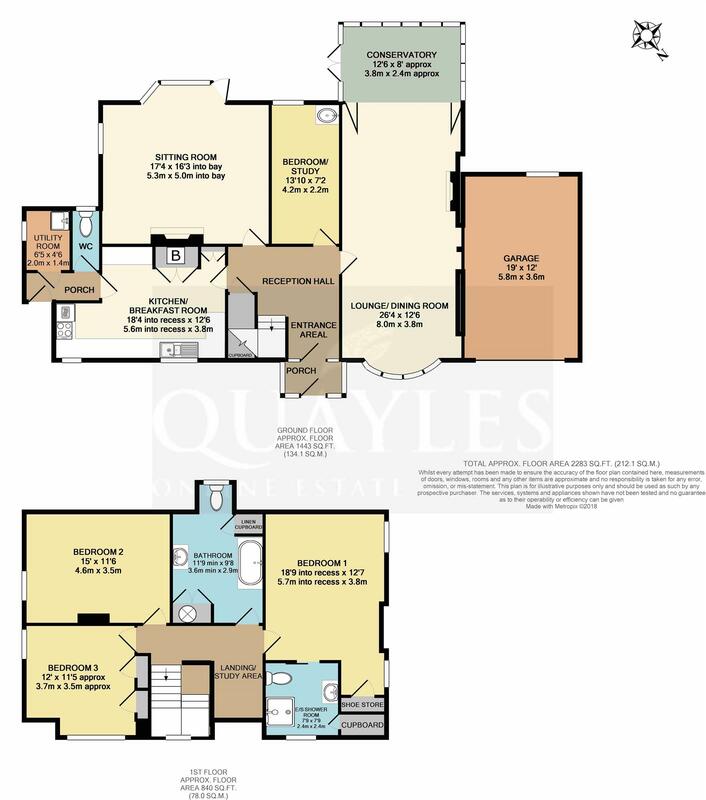 Generous 17ft 4 Sitting Room & Study/ Single Size Bedroom 4 with Vanity Unit. Good Size Breakfast Kitchen, Rear Porch, Utility and Cloakroom WC. 1st Floor Open Study/ Seating Area & Large Family Bathroom with Spa Bath. 3 Double Bedrooms, 1 with Built in Wardrobes, Master with En Suite Shower Room. Oil Fired Central Heating & Combination of Hardwood & uPVC Double Glazing. Established Front Garden, Large Single Garage & Ample Off Road Parking Space. Generous, Enclosed Rear Garden with a Southerly Aspect, Enjoying Much Privacy. Rear Laid to Lawn with a Patio Area, 2 Storage Sheds, Greenhouse & Apple Tree. From Parliament Square travel in a northerly direction along Bowring Road. Turn left onto the Jurby Road just opposite St Olaves Church. Continue along taking the third turning on the right into Richmond Road where The Dowry will be found about half way along on the left hand side, being clearly identified by our For Sale board. Of uPVC construction with a tinted polycarbonate roof and a half glazed entrance door. Tiled floor. A hardwood, double glazed multi pane door and matching side panels leads into the reception hall. A spacious area with inset coir matting to the entrance. An attractive half turned staircase with a hardwood double glazed window at the half landing leads up to the first floor. Smoke detector. Double power points. Deep understairs store cupboard with coat hooks and a light. A large through room with a hardwood double glazed bay window to the front and folding uPVC doors opening into the conservatory. An attractive feature fireplace with an inset gas fire has a tiled background and oak surround. Feature shelved recess. 'Egg and dart' coving with two matching ceiling roses. TV and telephone points. Enjoying a pleasant outlook over the rear garden. Of uPVC construction on a low wall base with a tinted polycarbonate roof. Plenty of opening top lights and a pair of doors to the patio. Multiple power points. TV point. Wall mounted spotlight. Laminate tile effect floor covering. Having a hardwood double glazed window to the rear looking out over the garden. Vanity unit with a top mounted basin. Coved ceiling. A naturally bright, dual aspect room with a uPVC glazed panel to the side and a double glazed hardwood half bay overlooking the garden. An adjacent glazed hardwood door leads to the patio. Feature fireplace with an inset electric fire. Decorative coving, TV and satellite points. A spacious room which could accommodate a breakfast table and chairs. Fitted with an extensive range of wood effect wall, display, base and drawer units together with a dresser style unit, tray niche and wine racking. Laminate work surfaces incorporate a 1 1/4 bowl stainless steel sink with a lever mixer tap. Space for a fridge/freezer and plumbing for a dishwasher. Built in 'Zanussi' electric double oven with a grill and adjacent inset 4 burner gas hob. Built in cupboard. Concealed 'Firebird S 120' oil fired boiler. Feature beams. Two hardwood double glazed windows. Background tiling and counter lighting. Ceiling rose and 'rise and fall' light. Telephone and TV Point. Vinyl floor covering. Door to the rear porch. A uPVC double glazed stable style door leads to the front parking area. Vinyl floor covering continues throughout the cloakroom WC and utility. Security alarm keypad. Tiled to mid height. Built in shelving. Modern push button flush WC. Obscure glazed hardwood window. Access to a small attic. Having a 'Belfast' sink and plumbing for a washing machine. Obscured, double glazed hardwood window. A generous landing with an open space, suitable for use as a study, reading area or place for a storage unit etc. Two double power points. Smoke detector and alarm sounder. An L-shaped dual aspect double room with uPVC windows to the front and side the latter enjoying partial mountain views. Recessed built in wardrobe and shelved cupboard. An excellent double room with ample space for a 6ft or twin beds. A uPVC side window enjoys pleasant distant hill views. Good height on the inner wall for free standing wardrobes if required. A superb room with an obscure glazed uPVC dormer window to the rear and an original built in airing cupboard housing the insulated hot water cylinder. Fitted with a classic/ contemporary white suite of WC, vanity unit with a top mounted basin and illuminated mirror together with a double ended spa bath with a glazed screen and 'Mira' pumped shower over. Additional shelved linen cupboard. Ceiling spotlight fitting. Chrome ladder style towel warmer/ radiator. Part tiled walls. Vinyl floor covering. Loft hatch. A superb double room which could comfortably accommodate a 6ft bed and free standing furniture. High angled ceilings to the front and rear. Two uPVC windows to the side. Recessed built in shoe cupboard. Sliding door to the en suite shower room. A light and airy room with a uPVC window to the front. Fitted with a modern white suite of push button flush WC and a vanity unit with an inset basin. A glazed enclosure houses an 'Aqualisa Aquastream' pumped shower. Eaves storage cupboard. Recessed LED downlights and chrome heated ladder style towel warmer/ radiator. Space for a shelving unit or laundry basket. 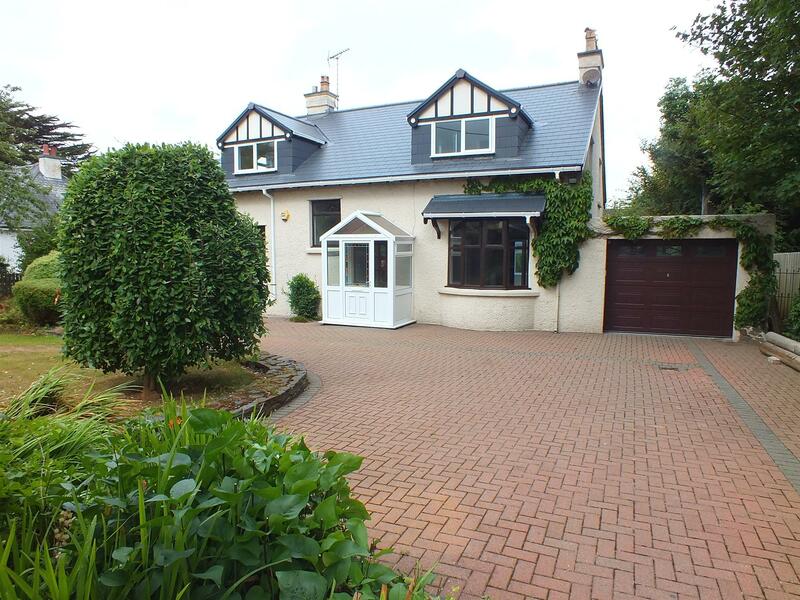 The property is approached by a gated, pillared entrance which leads to a generous block paved drive/ turning area. Much privacy is afforded by the established beech hedge, with a further pedestrian gateway and path to the side entrance porch. A shaped lawn with mature shrubs and plants to the borders offer colour and interest. Well fenced boundaries with gated access on both sides to the rear garden. Concealed oil storage tank. External lighting and power point. Having an electrically operated up and over panelled door and a uPVC double glazed window to the rear. Multiple power points. Lighting. Cold water tap. Enjoying a southerly aspect and enjoying much privacy with fencing and mature trees to the boundaries. Primarily laid to lawn with mature flowers and shrubs to the borders. Apple tree. Greenhouse and two brick built store sheds. Paved patio. Cold water point. All mains services are installed. Oil fired central heating and a combination of uPVC and hardwood double glazed windows and doors. Carpets, floor coverings and light fittings.